As a fellow trial lawyer, I know the incredible demands placed upon your time. Have you ever felt like you were being forced to choose between having either a fulfilling personal life or a successful professional life? If you’ve resolved to be more successful inside AND outside the courtroom this year, to enjoy more free time, or to take better care of yourself, I want to help you make sure that your New Year’s Resolution REALLY HAPPENS this year. That’s why I’ve created a brand new productivity and time management training program, taking the most powerful productivity techniques and strategies that I’ve ever discovered, and putting them into a simple system that WORKS, even for busy trial lawyers. It’s an easy to follow 90-day program that takes you step-by-step through proven techniques and strategies you can immediately use to take control of your time and your productivity. These are the same techniques that I used to go from working 90+ hours a week (and not having time for a pet, let alone a girlfriend) to living a life where I’ve been able to get even MORE done in LESS time, enjoy MORE success, travel around the world, start a family, and spend all the time I want with my new son! If you’re ready to do the one single thing that will help you regain control over your life, double your productivity, and allow you to enjoy a tremendous new level of success inside AND outside the courtroom, this is the program that will help you make it happen. Here’s what to do: Go to http://www.TimeForLawyers.com and sign up at the bottom of the page. You’ll immediately get access to the first “Quick Start Guide,” which will help you focus on the important stuff, and help you minimize the distractions that are preventing you from getting everything done. After that, each new video session will include simple exercises to give you the helping hand you need to get MORE done in LESS time, so you can enjoy success inside AND outside the courtroom. I’ve invested tons of effort learning all of these powerful techniques that I put into this single program – and I guarantee you that it will dramatically increase your personal productivity and success. How many trials (jury or non-jury) did you try this year? Should you have tried more cases? Fewer? Which one was your most memorable trial? Why? What was your most memorable moment in trial? What was your funniest moment in trial? What was your most emotional moment in trial? If you could change anything about how you tried any cases this year, what would it be? Did you give in too easily on any cases? Should you have gone to trial instead of negotiating? Did you push too hard or ask for too much on any cases? Should you have negotiated instead of trying the case? What trial advocacy skill did you improve most this year? 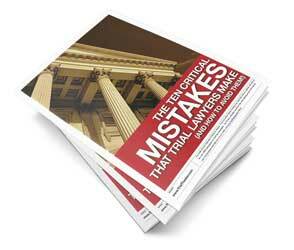 What was the best trial advocacy tip you learned this year? Did you have fun? Are you still having fun? What was the most important lesson you learned this year about trying cases? Invest the time to answer these questions honestly and bluntly. If you don’t like the answers, start making plans to change the responses for 2010. If 2009 wasn’t the year that you expected it to be, start making plans to make 2010 better. Post your best stories below, and share your year with the more than 10,000 trial lawyers who read these tips each week!